Recently a number of articles have listed new features in the iPad's latest 4.2 OS release in varying detail of how they may be useful. Below is a summary of my personal experiences with some tips that I learned. Previously run iPad apps remain suspended in the background in a save state until you retrieve them. For example you can open a slide in your Keynote presentation, switch to a Safari web page, copy text, quickly switch back to Keynote, and paste the text. Third party apps such as Pandora, NPR Music, and TuneIn Radio now multitask so it is finally possible to play music in the background while you run other apps. To display the Multitasking bar with the most recent running apps quickly tap the Home button twice. Swipe to the left to display another set of running apps. Press any app icon to activate its state, which may be as precise as a position in a web page or a specific slide in a Keynote presentation. Swipe the Multitasking bar to the right to display a multipurpose controller bar that contains from left to right an Orientation Lock button, a brightness control slider, audio controls (back, play-pause, forward), a volume control slider, and the current audio app such as iPod or Pandora. 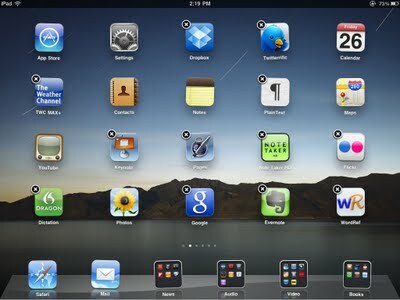 Note that the Orientation lock will only work for iPad native apps. Note! If you triple-tap the Home button by mistake then VoiceOver will activate - quickly tap three times in succession to turn it back off. Note! - there appears to a bug in AirPlay to AirPort Express. Although my computer and iPod touch consistently streams all music to my AirPort Express (connected to a stereo system), AirPlay on occasion disconnects after bringing up the Multitasking bar and is no longer available. After several attempts to re-enable (power down and restart, restarting the AirPort Express router, ) I finally succeeded by choosing Forgetting this network in the Settings > General > Wi-Fi > Choose A Network for the active local wireless network and then rejoining it. Although wireless printing is now available with an iPad, direct printing to a wireless printer is restricted to a select number of HP printer models: http://www.apple.com/ipad/features/airprint.html. There are currently three workarounds that I know, all of which require connecting a printer to an AirPrint enabled Windows or Macintosh computer. The printer can be connected directly via USB or by Print Sharing (which I have not yet tested). Run AirPrint Hactivator by following these instructions: http://netputing.com/2010/11/11/airprint-hacktivator/. A free, not-so-elegant at your risk solution for MacOS X. Run AirPrint Activator for Windows by following these instructions: http://downloadsquad.switched.com/2010/11/26/airprint-activator-for-windows-lets-you-print-from-ios-on-window/ . A free, not-so-elegant at your risk solution for Windows. In this example I opened a web page in Safari and then chose the option HP LaserJet 1022 to print the pages. I was never really enthusiastic with folder organization on my iPod touch when it is was available with update 4.0. The icons were small and the process too cumbersome to efficiently organize the apps - why bother? The iPad update was a pleasant surprise because using the App tray the process is really easy. Hold down an app to activate the icon arrangement mode (all the icons jiggle). Locate two icons that you would like to organize in the same folder. Drag one on the other and release. Name the new folder and click outside to release it. Drag the folder to the App tray and hold it there until it snaps in (you have a limit of six so others may have to be removed). You can now easily switch to different screens and drag related apps into your new folder. When finished keep the folder in the App tray or move it to a screen of your preference. In the screenshot below I have organized News, Audio, Video, and Books folders in the App tray. Things are much easier to find! Phonecasting Alternative to Drop.io ?